I wanted to highlight another aspect of our new Makerspace area – an area for creation and creativity. For making, coloring, and relaxing with investigative play. The LEGO station has been very popular! When I started up the area, I didn’t have any rules, I just said to the kids “here’s all this cool stuff, some books for inspiration, play with it, figure it out, and have fun!” …..but after a couple months of a wasted materials (ex: uncompleted duct tape raincoats that ended up in a huge sticky ball) and some messy LEGO behavior, I realized we did indeed need a few guidelines. Be willing to create and build with another student. before you leave- That’s nice! 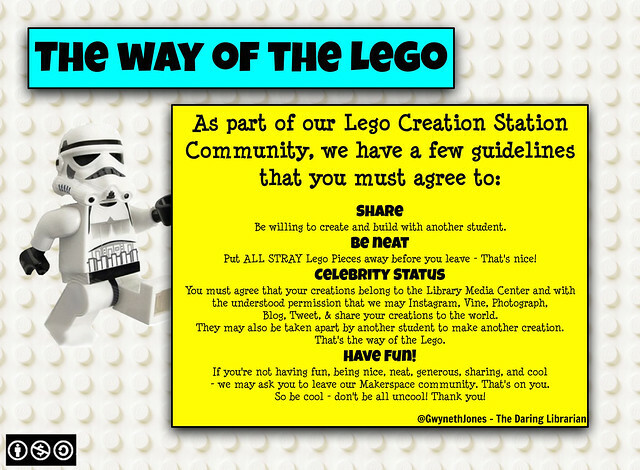 You must agree that your creations belong to the Library Media Center and with the understood permission that we may Instagram, Vine, Photograph, Blog, Tweet, & share your creations to the world. They may also be taken apart by another student to make another creation. That’s the way of the LEGO. If you’re not having fun, being nice, neat, generous, sharing, and cool – we may ask you to leave our Makerspace community. That’s on you. So be cool – don’t be all uncool! Thank you! Simple stuff, really! So the kids would feel ownership & a buy into these guidelines, I crowdsourced with the kiddos during recess to make the list, & then added my own twist to it – with a little help from the Countess LuAnn De LesSeps for the all uncool part! 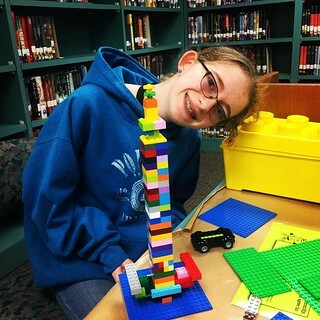 When Can Kiddos Visit the Makerspace? 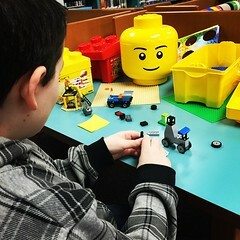 Kids can come to the Library before home room, during any class with a pass when they finish their work (standardized testing permitting), and during most all recess times – coverage permitting. (I have 7th grade lunch duty so I rely on volunteers during my shift) This is a time for them to check out books, read, recharge their devices, play games, and work with the Makerspace stations! It’s not quiet. And thats….OK! 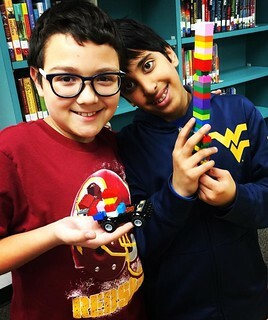 There is no “makerspace class” per se, it’s a resource kids can come to when they have time. It’s been used as a reward for some of our kids who need a little educational bribery err….incentives! (and LEGOS’s & coloring cause cavities!). Most of our kiddos really respond to it very positively. I even got a kiddo to to finish his MAP test who was ready to give up by saying he could work with the LEGOS afterwards if he did his very best. 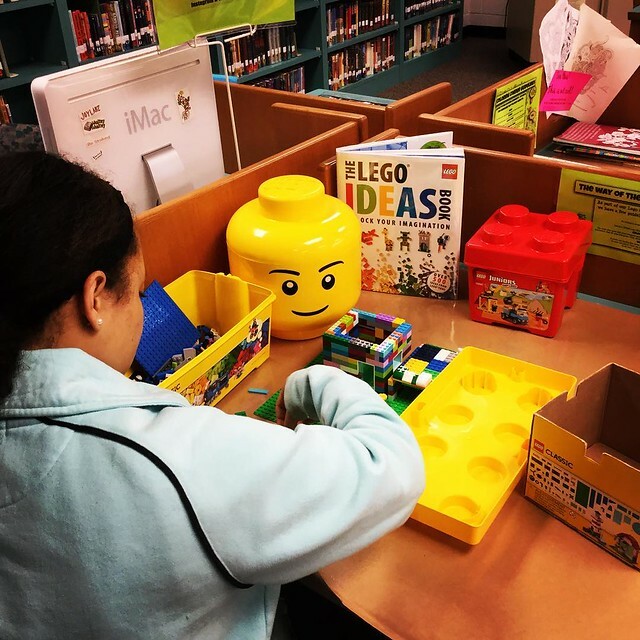 Come visit our LEGO Creation Station and Makerspace area the next time you’re in Murray Hill and if you have any old unwanted LEGO pieces laying around, and you feel compelled to donate them, we’d be super grateful!